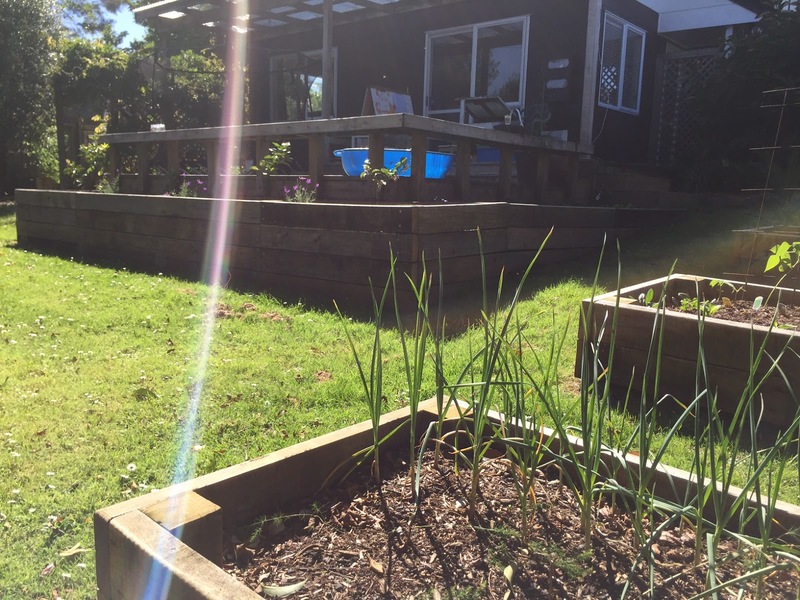 The above photo shows what our garden looked like when we moved in seven months ago. Never did I imagine it would have progressed as far as it has in such a short time. The hugest thanks for that goes to my brother-in-law, Ben, who built raised beds for me and championed me to dream big. After. Wraparound deck garden and raised beds. 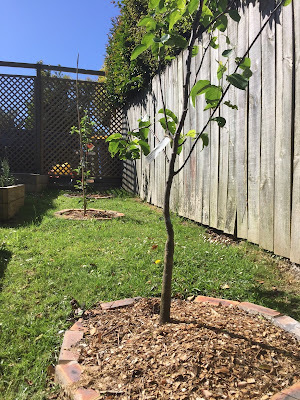 Setting up gardens can be expensive, so I thought I'd share a post explaining all the ways I cut costs by using free or waste resources instead of buying new. Every little bit adds up when you're doing a whole garden from scratch. 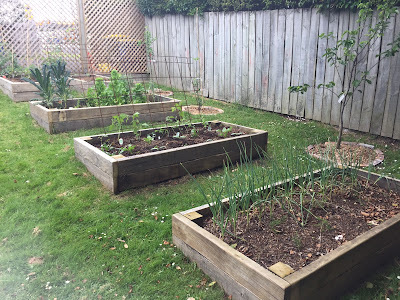 Raised beds and fruit trees. 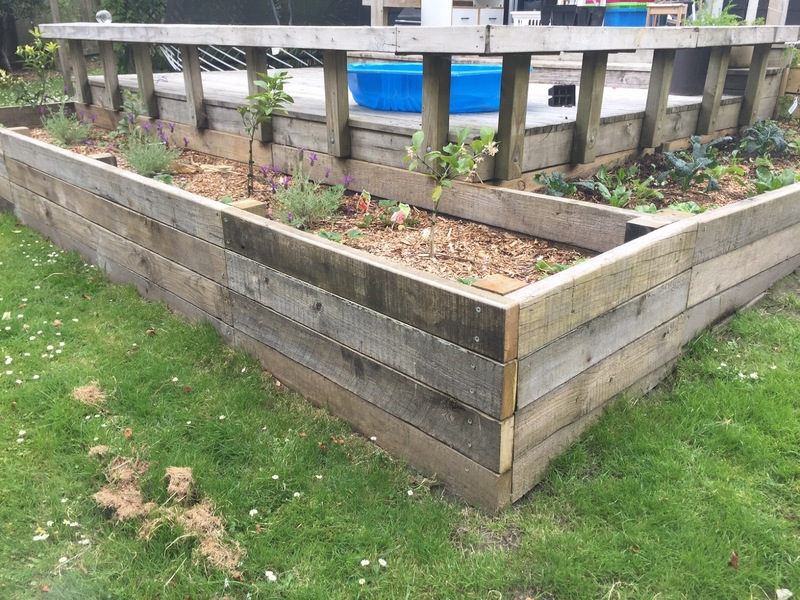 The raised beds pictured above were built using wood reclaimed from old farm fences. I filled the beds three quarters full with free materials - from bottom to top: cardboard, newspaper, cabbage tree leaves, twigs and small branches, grass clippings, dry leaves, used coffee grounds from a local coffee cart, untreated sawdust, chicken manure I collected from a friend's house, wood mulch, seaweed I collected from the beach, hay and rabbit manure I collected from my sister-in-law's hutch, more wood mulch, more coffee grounds and homemade compost. On top of these free materials, I layered bought compost to plant into. The layers underneath are slowly turning into compost, because I layered green nitrogen layers with brown carbon layers. 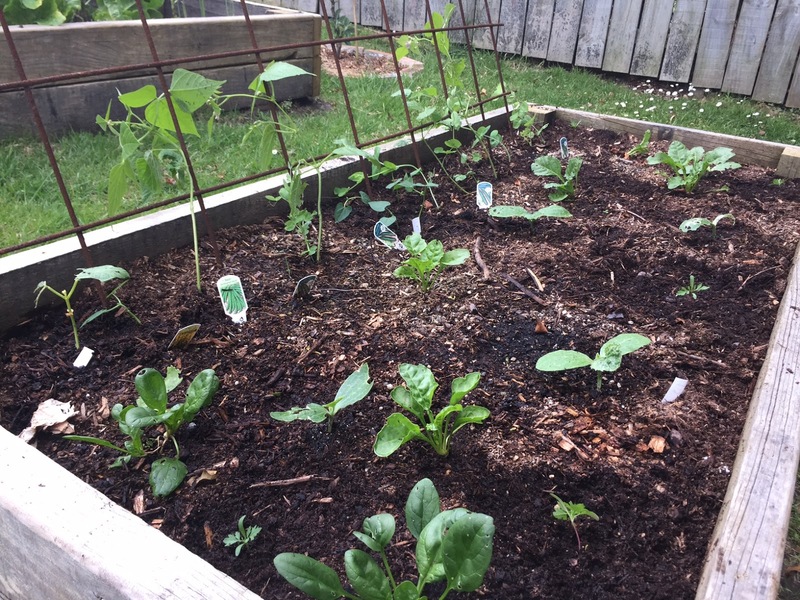 Beans, peas, spinach and courgette plants. The beans in the above photo are growing up an old metal trellis that Ben gave me. He uses the same type in his garden. 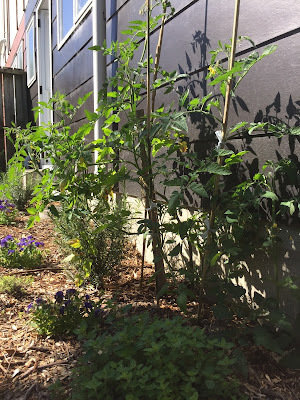 Self-seeded tomato plant and herbs. 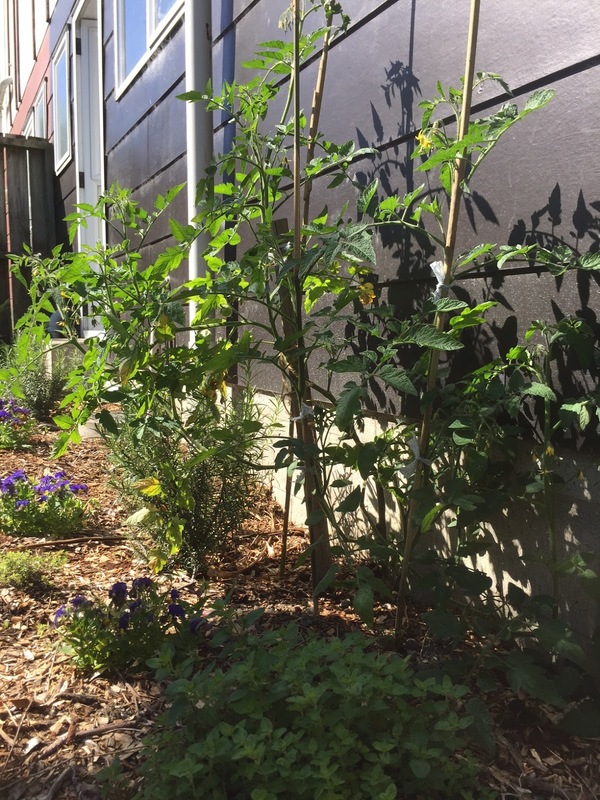 The tomato pictured above self-seeded over winter. It was in such a warm spot against the house that it didn't get frosted out, so I staked it with scrap wood and bamboo I picked up from a neighbour's garden. Some of the herbs dotted around used to be in pots, but they never loved their pots so it's nice to see them thriving in the soil. Most of the plants in the leafy green garden pictured above were grown from seed in a hot box Ben gave me - pictured below. 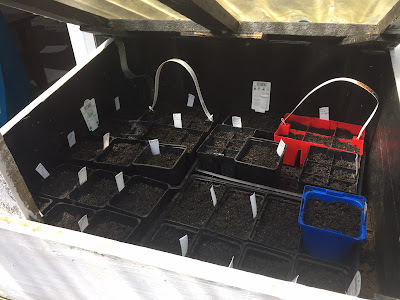 I reused pots from the garden centre to grow my seedlings in. I edged my apple trees and nashi tree with bricks I sourced from a neighbour who had his chimney removed. They were headed for the dump, so I saved my neighbour money and rescued a valuable resource. The much around the tree trunks is from a local mulch pile, so it was also free. 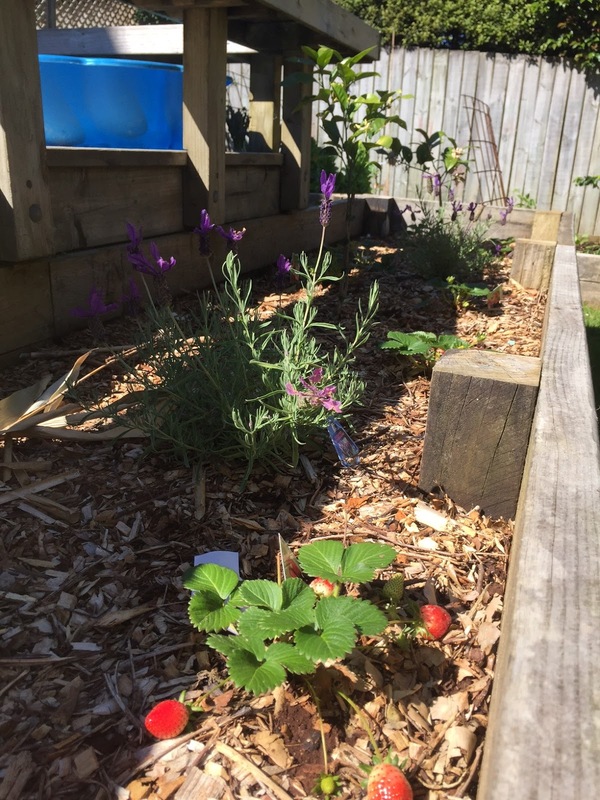 Strawberries, lavender and dwarf citrus trees. 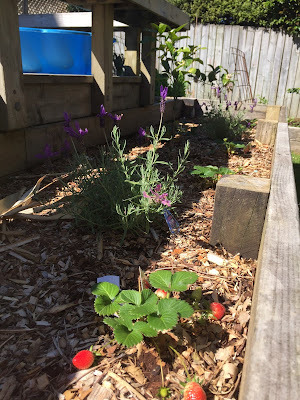 The soil around my strawberries, lavender and dwarf citrus trees is protected by wood chips I picked up free from a local pile. 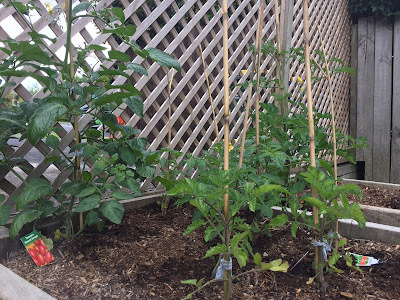 The same neighbour who gave me his bricks, also gave me bamboo from his property, so I'm using that to stake my tomatoes, as seen above. 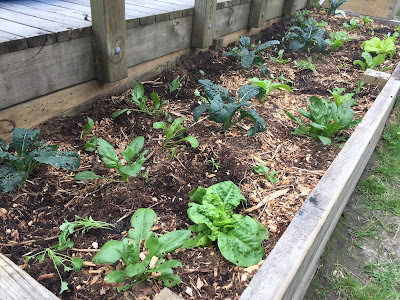 If you want to start a garden, ask around and keep your eyes open. You'll be amazed at what you can find for free - and what you can save from the landfill. Thanks Liz. I've really been getting into my permaculture, and it's helped to shape my plans and dreams for the garden.